The Pentagon has finally admitted David Hicks’ innocence: he was charged with a non-crime. Time for Howard, Ruddock and the government to pay compensation for their incompetence. The government lie that claimed David Hicks committed any crime is now done and dusted, officially. Hicks was, and is, innocent of any crime he has been charged with. The lie that he was a terrorist who had committed a crime was promoted by the Howard government, notably Prime Minister John Howard and Attorney-General Philip Ruddock, and by the Pentagon and US Administration. It has been perpetuated by the Abbott government, notably by AG George Brandis. But all their claims have now been officially admitted to be false and wrong in law. The Australian government faces the prospect of a considerable payout – in the many millions of dollars range – to Hicks for false imprisonment and for defamation. Photo: From the cover of his book. Hicks was sold to US forces in Afghanistan in December 2001 by the Northern Alliance militia for about $6000. He was kidnapped by the US and flown secretly to Guantanamo Bay in Cuba, where he remained for six years and was tortured, he says. His claim is entirely believable, because the CIA and the US military have now admitted being involved in torture at Guantanamo. In February 2007, Hicks was repatriated to Australia after agreeing to a plea deal on the single charge of “providing material support for terrorism”. At the time, Hicks says, he was being beaten and being deprived of sleep. He was given a seven-year suspended sentence by the Guantamo kangaroo court on what has turned out to be a non-legal charge. At the behest of the US Administration, Hicks was jailed in Australia for nine months at Yatala prison in Adelaide to complete the terms of his sentence. 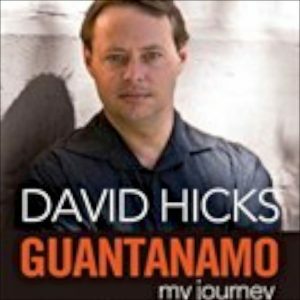 Essentially, Hicks “copped a plea” to get out of the torture hellhole that was Guantanamo. But, as it turns out, the “crime” that the Pentagon and US Administration – and the Howard government – claimed Hicks had committed was, in fact, not a crime. There was no such crime (material support for terrorism) on the statute books of the USA. The Pentagon, after years of claiming the white was black, has now in 2015 finally admitted white is white, and Hicks is innocent…and could never have been guilty. On Friday, 9 January 2015, a former prisoner of Guantanamo won a legal victory in the US, a year after he was sent back to his homeland in Sudan, the US Military Times newspaper reported in relation to another case with the same charge as that levelled against Hicks. Noor Uthman Muhammed pleaded guilty in February 2011 at a special US court for wartime offenses known as a military commission. The crime he pleaded guilty to was providing material support to a terrorist organisation and conspiracy. He was sentenced to 34 months on top of the nine years he had already spent at Guantanamo. But the Pentagon said on 9 Jan that the charges had been dismissed. A brief statement cited rulings by an appeals court that material support is not a legitimate war crime under the law authorising military commissions. Noor is officially innocent. Therefore, so too is David Hicks. Ruddock is still an MP in the federal parliament. He should be called to account by the parliament for why he jailed an Australian who had committed no crime. He, John Howard and their advisers were told clearly at the time by all sorts of people that material support for terrorism was not a legal charge available to the Pentagon and the US Administration, and that Australia should have no part in jailing someone charged with a non-crime. Howard, Ruddock and Australia had no right to jail Hicks: they acted illegally. Hicks has every right to sue the current Australian government for false imprisonment and for defamation for all the lies told about him being a terrorist and a criminal. In a world where there was better justice, he would be able to sue the US government also for kidnapping, false imprisonment and torture. But the US government does not play by the rule of law: it refuses to acknowledge the jurisdiction of the International Criminal Court. Civil Liberties Australia thanks everyone who has submitted comments, those published as well as those not published. We have now closed comments on this issue. Roger – Mr Hicks was training in mountain combat with a Pakistani mercenary company or militia (I forget which) to fight in KASHMIR. Against Indian army incursions. He had nothing to do with terrorism of any kind. And the court was pretty much a shambles by western standards, aka a Kangaroo Court. As evidenced by say: the fact they charged and convicted multiple people on a charge that isn’t on the law books. I’m with you, BUT did you forget or purposely omit to add the Rudd/Gillard/Rudd government as well. What did the Labor or Green party do for David Hicks or Schapelle Corby. NOTHING! This is what goes against you. You have to be fair, and blame both governments, otherwise you lose all credibility. what was the fool doing there? if he was shooting at our boys, he is a traitor, and should be shot! Let’s get real here. The claims made in this article are no doubt true, the rhetoric is inflamatory (no surprise) but the use of the term “kangaroo court” exposes the author to cursory dismissal from all except like minded people . Apart from that, any journalist worth his salt knows that you can’t start a sentance with a conjunction. Hicks may well be innocent and a worthy recipient of compensation but poorly authored comments like the above are not helpful. And the rhetoric of Howard, Ruddock and Brandis for well over a decade has not been inflammatory? – Yours conjuctively, Ed. Hadn’t been convicted of any crime neither breaking any law, Hicks was still deemed too dangerous to be released.. A world we created! I get the charge against the Sudanese guy was appealed which overturned his original charge, the same one as David Hicks was charged with. But I don’t see any admission or official statement or repeal of charges by the US Govt towards David Hicks. Won’t he need to appeal as well so it becomes official? I can’t see how you going to pin anything on Howard, Ruddock et al as they’ll just trot out the “advice they were given” line they used so successfully and so often – “children overboard”! At long last recognition of the persecution of David Hicks. You didn’t mention Alexander Downer in that list. He was there. Go David Go – get the whole rotten bunch of them. They were merciless, malicious and uniquely evil. Why did they do it? Why would anyone be so evil? thank goodness the poor man has been through enough. and yes should get compensation. the Australian government just left him there. no true support. no backing. nothing. Can he sue Howard personally ? Graham Broun, it seems this is the other side of the story. At long last – now for the fall out – me thinks Mr Murdoch and some of his cohorts, in particular Mr Bolt Mr Akerman and Ms Devine may also be a little concerned over their harangues. Mr Jones and Mr Hadley may also be somewhat concerned. Please explain. There is always another side of the story and as an Australian I want to hear it. Poor Neil James will have to get over his psychotic obsession with Hicks now. He is still proclaiming after all these years that Hicks is a criminal who got what he deserved.